This narrow, shortsighted view fails to take into account the full breadth of what’s involved in this merger — broadcast TV, cable TV, network technology, in-home technology, access to the Internet, and much more. In addition to asking whether or not regulators should permit Comcast to add 10-12 million customers, there is a more important question at the core of this deal: Should Comcast be allowed to control both what content you consume and how you get to consume it? This week, Comcast and Time Warner Cable executives testified before the Senate Judiciary Committee about why they think their merger is such a great idea. In their joint testimony [PDF], the execs made a point of giving hearty shout-outs to anyone they perceive as a competitor, in order to claim that the merged company won’t be a monopoly. That list of competitors repeatedly named AT&T, Verizon, DirecTV, Dish, Amazon, Apple, Sony, Google, Netflix, and Facebook as chief concerns. Some of those are easy to understand: the satellite companies directly compete with Comcast to get TV networks into peoples’ homes, for example, and the fiber companies do that plus broadband, too. But Apple and Sony? Amazon and Netflix? Facebook? If Comcast is the company that plugs the broadband wire into your home, then why are they so concerned about whose devices and services you might use once you’ve got that connection? Comcast is so concerned about all those other products explicitly because they aren’t just the company that plugs the broadband wire into your home. Comcast is already not only your carrier but also your content — and if they get their way they’ll become your gatekeeper to everyone else’s content, too. The post-2011, post-NBCU-merger Comcast is an absolute behemoth of a company. They’ve got reach into an enormous number of media, internet, film, and television-related businesses. And that’s without getting into their landline phone service, their web properties, their physical properties, their sports ties, or the several large cities where they own major local TV stations. Distilled, the core businesses from which Comcast makes its big money are as a cable TV distributor, as a broadband Internet access distributor, and as a content company. And the combination of those three elements gives it enormous power. Owning so many elements all the way up and down the whole process chain is known as vertical integration. (Horizontal integration refers to spreading a business wider, as the Comcast/TWC merger would do.) So for example, Comcast could take a 30-minute sitcom from production, to broadcast, to syndicated cable rerun, to on-demand, to a streaming service that goes right to your home on Comcast’s data network without a third party being any link in the chain. When vertical integration is used to prevent competitors from doing their business, it can be an anti-trust concern. That most famously happened when the Supreme Court broke up the Hollywood studio system in 1948. In 2011 when Comcast wanted to buy NBCUniversal, the FCC and the Justice Department updated the metrics [PDF] they use to analyze vertical integration and imposed some restrictions on Comcast to prevent certain foreseeable abuses from happening. Pay TV — cable, fiber, and satellite — all work through a series of contract agreements with companies that own the networks. The company that owns the content gets a fee from the distributor, and these are generally arranged on a per-network, per-subscriber basis. ESPN famously commands the highest fee of any cable network. So parent company Disney gets a little bit of money — in the ballpark of $5 — for every cable, satellite, and fiber subscriber in the country that has ESPN in their package (pretty much all of them). Smaller networks command much lower fees, because content companies are trying to get their little channels in front of more eyeballs to increase ad revenue. Bigger networks get much higher fees, because realistically if a cable company blacks out ESPN they’re going to lose an enormous number of subscribers. The money depends on who needs whom. But of course, this is the age of the cord-cutter. With somewhere between 95 and 100 million subscribers, pay TV is still a big deal… for now. The under-40 crowd is starting to opt out of pay TV at a rate that the industry didn’t see coming even a few years ago. But just because someone doesn’t pay for cable anymore doesn’t mean they don’t want to see the programming. Happily for Comcast, those cord-cutting households aren’t unplugging; they’re just replacing their pay-TV service with streaming-only options. And successfully doing that means maintaining a reliable home broadband connection… which Comcast, conveniently, also provides. Broadband competition is effectively nil in many areas, despite Comcast’s claims about 4G LTE mobile broadband. So buying TWC extends Comcast’s reach into that market, which they no doubt want to do. But there’s more to it than just selling access to the Internet pipelines. What comes down those pipelines matters, too. Under the recently-vacated net neutrality rule, an ISP like Comcast would be forbidden from working out a pay-for-carriage agreement with an Internet content company the same way they can with a cable network. But that rule was overturned early this year, and nothing yet has replaced it. Comcast is obligated, under the terms of its NBCU purchase, to keep adhering to the now-absent rule until 2018. But that rule has plenty of loopholes that can still result in services needing to pay for decent access to Comcast’s network. Of course, Comcast isn’t just sitting around finding ways to charge companies like Netflix for carriage; they’re out there competing directly in the same space. The trade and lobbying group for the big cable companies, the NCTA, has a chart on their website under “competition” where they list the biggest video subscription services. From largest to smallest, the list includes Netflix, Comcast, DirecTV, Dish, TWC, Hulu, FiOS, U-Verse, Cox, and Charter. Eight of those are companies that provide pay TV service, and can easily be considered competitors with each other. The other two though, Hulu and Netflix, are internet-only content-only companies that don’t care who you get your broadband connection from, as long as you’re in front of a screen that can access their apps or websites — and Comcast already owns about a third of Hulu. The joy of being a vertically integrated company is being able to exercise something called vertical leverage. Basically, the bigger Comcast gets, the more extraordinary financial power they wield. The terms they can negotiate upstream and downstream are more likely to be favorable to them, and not to anyone else. A report [PDF] from the Consumer Federation of America calls these “bottleneck points.” And the bigger Comcast gets, the more of them they have — as in their recent peering dispute with Netflix. Comcast also has ways of keeping paying consumers, not just other businesses, playing on their turf. In 2012, for example, Comcast declared that while time spent streaming video through YouTube or Netflix counted against a customer’s monthly data cap, data streamed from Comcast’s On-Demand service would not. And what about that X1 platform that Comcast keeps touting in all if their testimony, filings, and self-congratulatory website posts? It’s the company’s next iteration on a cable box: a cloud-based, remotely accessible platform that integrates DVR, currently-airing TV listings, and Comcast’s on-demand video. It is convenient for Comcast subscribers… and it’s also a way to keep them from ever wanting to turn on another device and log in to Netflix instead. Comcast even manages to find a way to use its extensive gatekeeping to prevent paying subscribers from accessing material they paid for. HBO subscribers who get their premium channel from Comcast can’t use the HBO Go app on certain platforms (Roku and PlayStation) even though HBO supports it — because Comcast’s authentication process doesn’t. 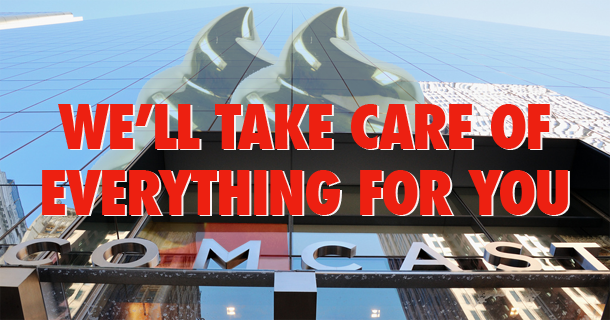 Right now, Comcast is limited by legal agreements not to behave in too shady a manner. They had to relinquish management control of Hulu, for example, and those net neutrality requirements remain in place. Getting the merger with Time Warner Cable through the approval process would likely require some sort of nod to broadband competition as a concession. But Comcast has a really bad track record of actually obeying those orders. Once it gets the green light to go ahead with a business move, they generally just do what they want. Consumer advocacy groups aren’t the only ones worried about Comcast’s continued expansion plans: lawmakers from both parties have their doubts. Those concerns aren’t just about who runs wires where, and what company a consumer pays to get service. They’re about what customers are allowed to consume. Whether the reasons for locking a content provider out of distribution access are politically motivated or simply financial, the end result is the same: consumers have narrower access. And that’s the future that’s coming to pass. Comcast already controls the production, distribution, and exhibition pipeline for content — both in the traditional TV space and also in the streaming space. But Comcast’s reach, despite the dearth of true competition in most markets, isn’t yet universal. A few other companies are big enough that they can still provide tiny obstacles to Comcast’s vertical leverage. In the end, making Comcast bigger only gives it more leverage — a company that would control the lion’s share of to-the-home information for this country. Until such a time when (and if) wireless and fiber providers begin offering a service that competes with cable Internet on speed, availability and cost, consumers are only going to see the walls around Comcast’s sandbox grow taller, while bottlenecked Internet businesses face higher and higher tolls for access to a huge portion of American homes and offices. In this game, the only one who wins is Comcast.